Many of the islands of Indonesia were formed by volcanoes and still benefit from soil that's rich in volcanic ash and ideal for growing coffee. 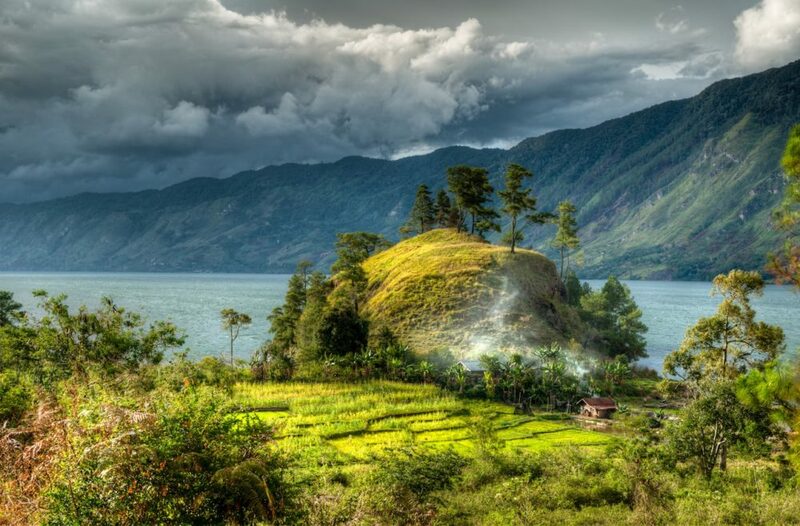 It's no wonder that some of the world’s most famous coffees are grown on the islands of the Malay Archipelago of Indonesia: Sumatra, Sulawesi and Java. Approximately 15 percent of all the coffee grown in Indonesia is Arabica. Sumatra is the second-largest island in the Republic of Indonesia. Sumatra Mandheling coffee is grown on the lofty volcanic slopes of Mount Leuser near the port of Padang, in the Batak region of west-central Sumatra. “Mandailing,” spelled here correctly, is technically an ethnic group in Indonesia, not a region, as is Batak. Coffee trees were originally brought to Indonesia in the early 19th century by the Dutch, who sought to break the world-wide Arabic monopoly on the cultivation of coffee. Within a few years, Indonesian coffee dominated the world’s coffee market. Yet by the end of the century disease had completely destroyed the crop. Coffee trees were successfully replanted and quickly gained a large share of the world market until the plantations were ravaged again during World WarII. Giling Basah, the unique method used in the production of Sumatran coffees, results in a very full body with a concentrated flavor, garnished with herbal nuances and a spicy finish. It involves hulling the parchment off the bean at roughly 50 percent moisture content (compared to 10 to 12 percent moisture, in most other regions). This unique process results in Sumatra's trademark flavor profile (low acidity, richness that lingers on the back of the palate, and a chocolate finish) and gives the green beans their signature color. InterAmerican buys Grade 1 Sumatras as Double-Picked (DP) or Triple-Picked (TP), referring to the number of times the coffee is hand-picked for defects. This extra quality control measure results in a very consistent cup that includes only cherries at optimum ripeness. Strong notes of cedar, sweet tobacco, chocolate and spices; winey acidity, consistent and balanced.